The ND:YAG laser system introduces a gemstone-adjusting Q-switch that effectively pulverizes and removes pigments in pathologically varying tissues by instantly emitting a beam of light. This is a beam-guided explosion: a fixed-wavelength beam of light activated by accumulated high energy can reach the pathologically altered tissue through the epidermis in a very short time (only 6 ns) to immediately comminute the corresponding color substrate, and then corresponding Due to the high energy, some pigment groups are ejected from the human body (shallow skin), and the rest (in the basic tissue) pigment group will become very small particles before being swallowed by humans, and finally circulate through the lymphatic system. The pigment of the pathological tissue will fade until it disappears. And the surrounding normal tissue will not be destroyed because they will not absorb fixed wavelengths. 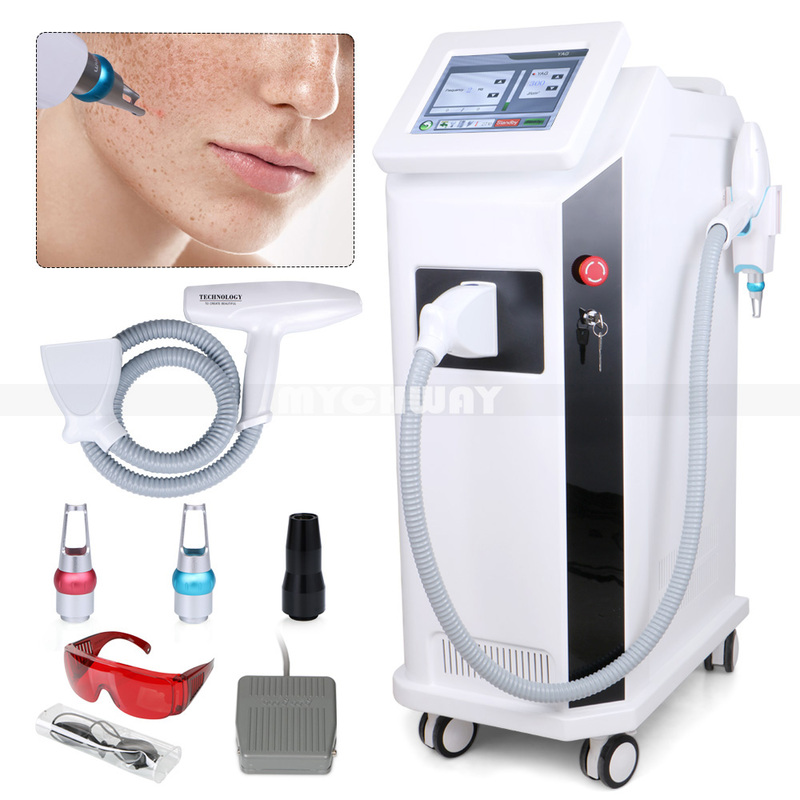 The system gem-adjusting Q switch can effectively cure the mixed pigments by pigment precipitation of extraneous source with pathological pigment change of endogenous source, inclusive of erroneous dark eyebrow-embroidery, lip-embroidery, lip-soak, eye line-embroidery, lip-line, tattoo (inclusive of tattoo by extraneous wounds), pigment precipitation by sensitive source, freckle on female\'s face (male\'s), coffee spot, old age spot, black mole, and birthmark in black, blue, purple, brown, red and etc. 1. Precise manufacturing, stable and effective performance, high-end design. 2. Specially designed cooling system ensures continuous operation. A microcomputer counts the number of shots fired. 4. Portable, seismic and convenient for transportation. 6. No damage to normal tissue. 7. Pigmentation removal has no side effects or scars. 8. Short use time and remarkable effect. Laser tattoo removal is a safe and effective technique for removing tattoos. It is simpler and faster than previous surgical removal methods. This technology is currently a relatively mature, economical method of removing tattoos, replacing the old methods of chemical tattooing and surgical removal of tattoos.